Gawain was in fine form today and his preparation worked well with a good advantage in the opening and managed to convert without too many problems. Something funny that happened is a finger fehler which I haven’t heard of before but it’s when your hand and brain don’t quite coordinate and your hands plays different move than the one his brain intended. (Ga meant to play Re1 but instead played Rd1).The game was of quite good quality so you can either download games from the website or replay it here! 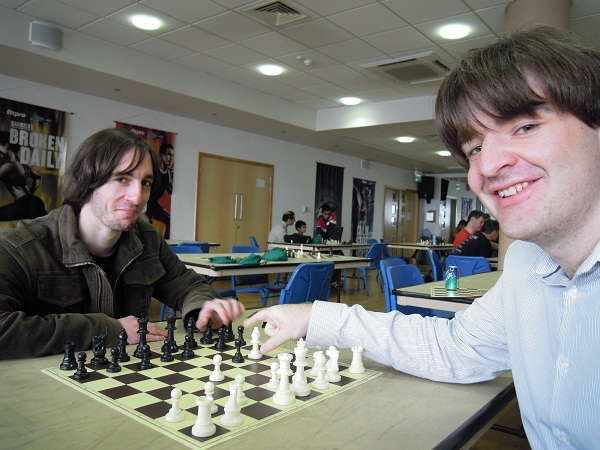 Paired up tomorrow is GM Stuart Conquest who now spends most of his time organizing the Gibraltar Tradewise Festival, having been the commentator for several years. It’s an interesting pairing (again with the acceleration) with 8 people on 2/2 including IM Susan Lalic who has had two shock wins against GM Simon Williams and GM Mark Hebden.